Ditch Witch, a Charles Machine Works Company, has released a new line of backreamers to help underground construction operators improve productivity in specialized soil conditions and installations. Sandhog HD Designed for sandy and soft soils, the Sandhog HD (heavy duty) backreamer combines aggre.. Specifically designed to fit Volvo L110-L350 wheel loaders, the Volvo Sand bucket, Volvo Rehandling Flat Floor bucket and Volvo Rehandling bucket enable operators to reduce cycle times through more efficient material handling and increased material capacity. They also reduce fuel consumption by up t.. Bit Brokers International introduces polycrystalline diamond compact (PDC) bits to its line-up of products. These bits are designed for high-speed drilling in shale, limestone and sandstone formations. Unlike roller cones, these PDC bits are one-piece matrix bodies with no moving parts. The matrix ..
McLaughlin has introduced the new ECO truck-mounted vacuum excavator series to answer the market’s demand for a compact vacuum excavation system that focuses on performance and improved fuel efficiency. Powered by 49, 85 or 99 horsepower (37, 63 or 74 kW) auxiliary engines, ECO Series vacuum excavat.. In a spin-off from the Hertz Global Holdings Inc. car rental business, Hertz Equipment Rental Corp. has become Herc Rentals, a stand-alone and publicly traded company listed on the New York Stock Exchange under the symbol “HRI.” Herc Rentals is a premier, full-line equipment-rental supplier with 28..
Christine Wehrman, CEO and executive vice president of the American Rental Association (ARA), was presented with the European Rental Association (ERA) Lifetime Achievement Award. Wehrman, who previously announced her planned retirement from ARA, was honored by the recognition. “It has truly been a.. In providing water and sewer services to 50,000 people through more than 16,000 residential, business and industrial accounts within Niagara Falls, NY, and adjoining areas, the Niagara Falls Water Board (NFWB) continually invests in infrastructure to maintain facilities while economically providing ..
Infrastructure Repair Systems Inc. provides a wide variety of trenchless point repair products to fix sewer pipes that have structural defects. At the top of the line is the Super HD Liner. Designed and engineered to stop I & I, this liner has a thickness that is required for extreme depths and exc..
Hydromax USA and Detection Services have come together to deliver p-CAT, a low-cost, non-invasive, non-destructive, reliable and safe solution for pipe condition assessment, while the system is in operation. Often described as a pipe screening tool, p-CAT can quickly test thousands of feet of pipe .. Experience UCT 2017 in Fort Worth! We are gearing up for the 22nd annual Underground Construction Technology International Conference & Exhibition (UCT) Jan. 31-Feb. 2, 2017 at the Fort Worth Convention Center in Fort Worth, TX. At UCT, the focus is on you: your education, your business. Whether it’s the latest in trenchless or ope..
CUIRE will hold its 15th annual trenchless technology inspector training and certification schools Jan. 29-30, 2017, in conjunction with the Underground Construction Technology International Conference & Exhibition at the Omni Hotel in Fort Worth, TX. This year’s program includes a full-day of Geote..
Planning is being finalized on a Geotechnics for Trenchless Construction short course co-sponsored by the Colorado School of Mines Center for Underground Construction and Louisiana Tech’s Trenchless Technology Center. The three-day session will be held Nov. 1-3 at the Colorado School of Mines (CSM)..
Daytona Raising Project Creates Speedway For Attendees As the Daytona Speedway continues its $400 million construction project, one key part was the improvement to nearby roads that would enable the smooth flow of some 100,000 spectators before and after a race or event. Existing stormwater ditches..
Third In A Series Construction organizations with positive safety records establish and implement programs designed to eliminate job-site injuries. 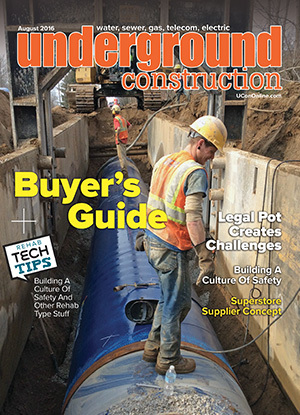 However, there is another element that appears to set the most safety-conscious companies apart – a culture of safety that permeates the organization ..
Twenty-five years ago, David Bartosh quit his job at an equipment rental store to establish an underground construction supply business in the Atlanta, GA, area. Bartosh’s new company was a parts supply and service business operated from his home garage. Operations soon moved to a 700-square-foot r..
By Jeff Griffin, Senior Editor No question about it, drugs in the workplace are dangerous. Drug use on construction job sites poses risks to the drug user, coworkers, employers and the public that are more serious than in other work environments. Drugs often abused can include prescription medica.. The Toro Company has announced the newest and most powerful member of its Dingo compact utility loader (CUL) family. TX 1000 has a rated operating capacity exceeding 1,000 pounds, the strongest in the category. Also unique is the vertical lift loader arm, with 81-inch full height, and weight-to-powe.. The CASE SV300 was the industry’s first vertical lift skid steer to include selective catalytic reduction (SCR) technology, which significantly lowers fuel consumption compared to DPF systems. The SV300 delivers best-in-class torque (282 foot-pounds), bucket breakout force (up to 8,776 pounds) and 3.. Operators looking for increased performance and productivity in a 74-hp machine will find it in the new Bobcat S595 skid-steer loader. With 2,000-pound rated operating capacity, S595 is ideal for those who need to lift and carry more material, without moving up to a larger machine size. Standard fea..
Caterpillar is rolling out the six-model D Series with rated operating capacity ranging from 1,800 to 3,700 pounds. A completely redesigned cab features first-in-class operator environment and controls for maximum comfort, security and productivity. The new, sleek lift-arm design enhances visibility.. Additions to Volvo’s C-Series are the radial lift MC60C and MC70C, and the vertical lift MC85C, MC95C and MCT85C. Rated operating capacity for these models ranges from 1,350 to 1,900 pounds, and gross engine power from 48 hp to 59 hp. Featuring a unique single loader arm design, the C-Series deliver..
As the newest addition to John Deere’s mid-frame E-Series, the 324E skid steer packs all of the performance features of its larger-framed siblings into an agile, ultra-efficient compact design. Key highlights of the 74-hp 324E include upgraded controls and boom performance, auxiliary lines that are ..
Big oil producers are expressing serious doubts about moving forward with a multibillion-dollar liquefied natural gas export project in Alaska at a time when world energy markets are flooded with fuel and natural gas prices are half of what they were two years ago. But that isn’t stopping Alaska Go..
A New Jersey State Superior Court judge clearly rejected a lawsuit filed by HALT, an association of New Jersey landowners in its attempt to prevent the PennEast Pipeline from being built. Dismissing the complaint for trespass and nuisance filed by HALT and several of its members, the court denied t..
San Francisco Baykeeper and the city of San José announced a legal agreement to make the Bay Area’s largest city a greener one. As part of the agreement, San José has committed to make significant future environmental investments by implementing more stormwater capture projects, or “green infrastruc.. According to Bluefield Research, capital expenditures (CAPEX) for U.S. municipal water and wastewater utilities are expected to exceed $532 billion between 2016 and 2025, almost 28 percent more than CAPEX during the last 10 years. A significant decrease in federal funding for water utilities — $4.3.. The Association of Equipment Manufacturers (AEM) has announced five winners in the second, “Dream”, phase of the Infrastructure Vision 2050 Challenge. Launched earlier this year, the three-phased competition challenges a community of innovators to reimagine personal mobility, freight movement, and ..
by Robert Carpenter, Editor in Chief Two significant developments related to the Flint, MI, lead-tainted water crisis popped up recently and, sad to say, I’m not surprised. As the repercussions continue to reverberate, public pressure mounts on local and state officials who in any way could be held..